Thank you for your order for Inklingo. Monkey and I have some tips to get you started. I send a Welcome email to every new Inklingo quilter, but sometimes it is filtered into junk/spam, so you can view it on the website. If you have never printed on fabric before, you should start now! You need a piece of freezer paper, a scrap of fabric, and an iron. That's all. When you have printed on fabric once, you will see the advantages. Use a hot, dry iron (no steam) and press on both sides—the paper side and the fabric side. As long as there is a firm bond between the fabric and the freezer paper, jams in the printer are rare. Always wash fabric first to remove the sizing. Otherwise, the freezer paper is not likely to stick well enough. If you are opening Inklingo for the first time, see Support > Download Instructions. The Bookmarks panel should open automatically in Adobe Reader, but if it does not, please open it so you can find your way around. One way to open the Bookmarks is View > Show/Hide > Navigation Panels > Bookmarks. You can find your way around with Bookmarks, without even knowing the page number! How cool is that? In the BOOKMARKS, scroll down to Catalogue of Shapes + THE SHAPES. Click on the + sign to the left (a triangle on Mac), to open a list of more pages underneath. Click + beside COMBO 2, then + Diamond Triangle Square, then Color 11. Click on the page for Inklingo color 11 and look at the shapes. You will see triangles (QST), squares (SQU), and diamonds (DIA) drawn with lines in a grayish/purplish color, and the icon to the left of Inklingo color 11 in the Bookmarks with be gray instead of white to indicate that you are on that page. The Layout of Shapes is 13 x 19 to give us maximum flexibility, but we normally only print part of the page to get exactly what we need on an ordinary printer (8.5 inches wide). The description of the shapes is on the page at the main heading "Diamond Triangle Square," and the page after that shows suggested Custom Page Sizes. (These pages are used together.) Below "Custom Sizes" in the Bookmarks, there is a list of 20 pages with the shapes in 20 different colors. Inklingo color 11 should show well enough on most light or medium fabrics and wash out easily, or at least not show on the front, so we'll use it first. You want to be on that page for the next step. Explore the free shape collection and take the Guided Tour to become familiar with the way the shapes are organized. Click File > Print (or Control P, a useful shortcut). Make sure Page Scaling is set to "none" in the print dialog box (above), so the shapes print the right size. Page Scaling "none" might be called "Actual Size" or 100%. The terms vary but the meaning is the same. NOTE If you are using Adobe Reader DC, "Save ink/toner" must NOT be checked. The fabric will be printed like the purple fabric. Notice that if you had printed fabric 6.75 x 9.75 instead of 8.5 x 11, you would have 8 diamonds, 4 triangles, and 4 squares with no waste—and that is perfect for LeMoyne Star. The lines are very fine and perfect, and the advantages are clear: It is easier to cut on a line without any measuring, and it is easier to sew with a line to follow. When you see precise diamonds, triangles, and squares coming out of your Inkjet printer, we think you will want to print a sheet of contrasting fabric right away, so you can mix the shapes to sew two mirror image LeMoyne Star blocks for Tilde's Tiny Totes (free pattern). Now that you've printed on fabric once, you are ready for 3 tips in the Support > Quick Start Guide. Test Pages - Be confident that the ink will not show in the finished quilt. 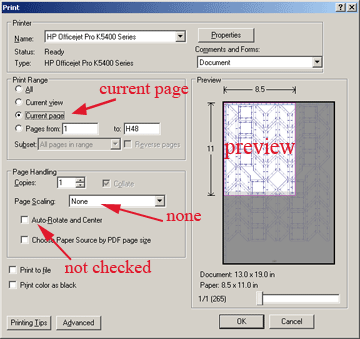 Custom Page Sizes - Use fabric efficiently by entering a custom size in the print dialog box. Layouts of Shapes - 8.5 inch printer, but 13 x 19 inch pages! Many quilters do not take full advantage of the cool navigation tools in Adobe Reader, but the Guided Tour explains Bookmarks and more. There is also a two minute video at Shop > Getting Started. If you haven't already, review CHAPTER 1 - THE INKLINGO HANDBOOK in the Bookmarks panel of the free shape collection. The instructions for opening Inklingo are at Support > Download Instructions. There are answers to frequently asked questions at Support > FAQ, but please don't wait until you are frustrated if you need to contact me. There is always a simple answer and I am happy to help. System Requirements Windows or Mac with Adobe Reader (free download)(or Acrobat). Inklingo will not open in other PDF viewers. Mac Users: See the note about Mac Preview in the download instructions. The Smart Shopper's Idea Book will help you decide. See how you can get the design books for free! There are mini-tutorials on the blog and the archives are searchable too. Or, you can jump directly to the answers. COTSG is perfect for Inklingo beginners, even if you aren't making the quilt. The clues take the mystery out of Inklingo. We are adding more Inklingo videos as fast as we can. You can subscribe so you don't miss anything good. We share everything on the All About Inklingo blog first. If you turn on your speakers, we think the video will make you laugh. I am happy to help and I always answer email as quickly as possible.